We Loan Anglers Fishing Gear Free of Charge! Many Alaska Department of Fish and Game (ADF&G) offices have fishing rods to lend. The type of fishing rods and the extent of gear in the Rod Loaner Program is dependent upon the local fishing opportunities and fishing conditions. A current sport fishing license for Alaska residents 18 years of age or older, or non-residents 16 years of age or older. It’s quick and easy to buy your license online. Terminal tackle (hooks, lures, weights, etc.). If you need suggestions, we can help! A copy of the latest Sport Fishing Regulations booklet. Regulations are available at any ADF&G office, at many businesses across the state, as well as from our Sport Fishing Regulations webpage. Proper attire (please dress for the conditions). A positive attitude (sometimes fish just don’t bite). The equipment is to be used for legal sport fishing activities. 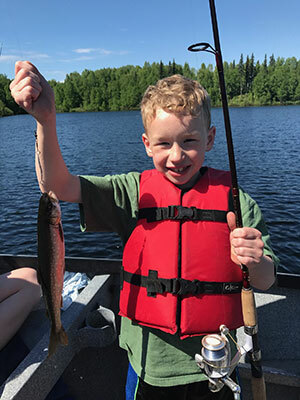 It is the borrower’s responsibility to ensure that all parties using State of Alaska equipment have a current valid Alaska sport fishing license if they are required by law to purchase one. It is the borrower’s responsibility to ensure they are familiar with the fishing regulations and emergency orders that apply to their fishing destination. The borrower may check out no more than 3 fishing rods at a time. (Case by case exceptions can be made for organized groups such as the Boy Scouts). Borrowers may only check out the same type of equipment twice per year, e.g. spinning rods and ice fishing gear. The borrower is responsible for returning the equipment after a maximum of 3 days. Equipment loans cannot be extended and must be returned to the same office that the equipment was loaned from during normal business hours. Failure to return equipment after 3 days of use will result in borrower information being turned over to the proper authorities. If unexpected circumstances arise, the borrower will immediately notify the ADF&G office that lent the equipment. The borrower understands that the State of Alaska, Department of Fish and Game, is not responsible for any injuries or damages caused or incurred by use of this equipment. The equipment may not be used for monetary gain of any kind, including, but not limited to, charging other individuals to use this equipment, or using it for personal, business, or organizational financial gain.